Saturday’s column was about Peter Pokrifcsak of Martins Creek, an Army Air Corps flier who drowned on D-Day. Sad as Pokrifcsak’s story is, it’s the kind of thing that happens in a war. Brave men and women are killed. The twist here was that his family didn’t know what exactly happened until military researcher Bill Beigel began investigating the case. Arthur Haring and Peter Pokrifcsak in The Morning Call, Sept. 6, 1942. Katherine was just 6 years old when her 19-year-old brother pursued his interest in planes by moving to California to attend Aero Industries Technical Institute in Los Angeles and work at Vega Airplane Co., a subsidiary of Lockheed. Her collection of photos and letters from her brother includes shots he took on a trip to Catalina Island, Calif., on Dec. 7, 1941. 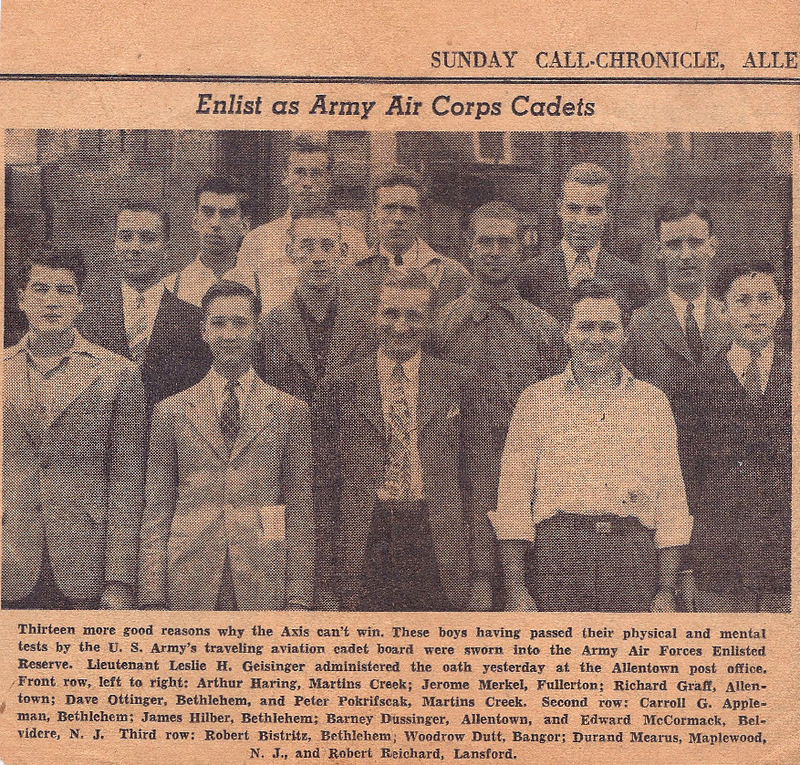 He enlisted the next year and was called to active duty in March 1943. His letters describe his life during training and later at war, although he tended to downplay the danger he faced, focusing instead on his recreational activities and asking regularly about his mother’s canning back home and Katherine’s progress in school. Still, you get glimpses. He wrote on Aug. 23, 1944: “I got number five mission in yesterday. I had a little trouble with one of my guns when I test fired them. But I got it fixed alright. I don’t know if I told you or not, but over here I’m in the top turret instead of the tail. I like it, but it is a little hard getting to when you got your flak suit on, ha ha! Interestingly enough, he also wrote about D-Day, which for him was Aug. 15, 1944, when the Allied invasion of southern France began. It was known as Operation ANVIL. He wrote, “This is the big day and I’m glad I am in on it. I wouldn’t want to miss this for anything. “We had a meeting last night and they told us what was going to happen. They told us about how many men and ships was taking part. “… We been looking forward to this for about the last two weeks. And if it works out as well as they say, I hoping to be home for Christmas. Ha! Ha! According to an Express-Times story, Staff Sgt. Haring received the Air Medal with two Oak Leaf Clusters, the Presidential Citation with one Oak Leaf Cluster and the Croix de Guerre with Palms from the French government. DiFebo says she first came upon her brother’s wartime letters about 10 years ago and read them all. But it wasn’t until a month ago that she learned about all the letters he had written from California. Her nephew came across the letters as he was cleaning out the family home. “He thought I would want them,” she said. He was right. “I got to know him through the letters,” she explained. She took me this week to Church Hill Cemetery, where Haring and Pokrifcsak are buried. It’s a beautiful spot, but their graves are a silent reminder of the cruelty of war — and sometimes, of life itself. “They were so young,” she said. Bill White’s commentary appears Tuesdays, Thursdays and Saturdays.